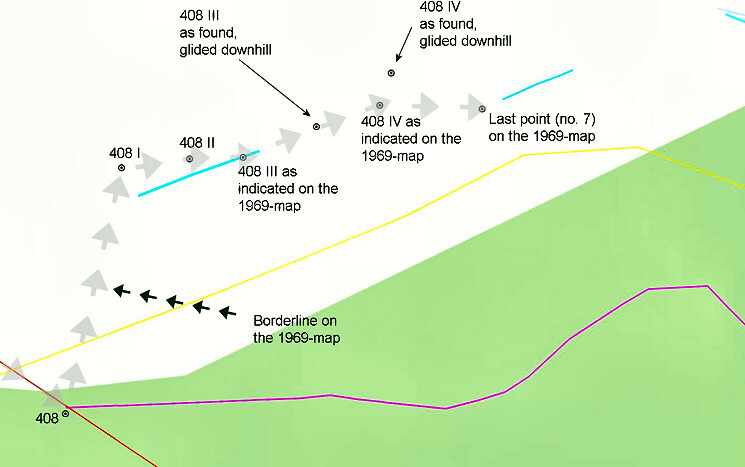 In 1969 four submarkers were placed on an isolated hillside between bm408 and 409. Nr. I and II are still there, the other two were unfindable until 2018. Their history is a long and intriguing story. I believe their existence is a misstake. On 20090608 I thought I had found bm408. I remember being puzzled by the "I" above the number, wondering if it was a submarker. But the description in the "Procès-Verbal" fitted well: above the source of a stream. But I discovered later that the real bm408 is a large pillar similar to bm409. 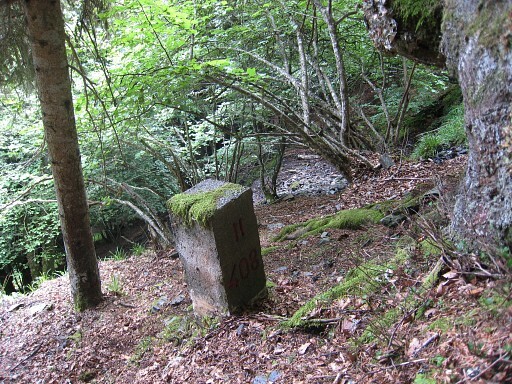 In addition, I learned in january 2011 from Charles & Josette Darrieu that this is one of 4 submarkers, placed in the 1960-ies after a border-dispute involving forest exploitation. Bm408-I stands a few meters higher to the SE of a source. It's the source of a small & steep stream: a sort of cascade. At the bottom of the cascade, the stream soon disappears in a field of fern. Bm408 II is about halfway the cascade at its N-side. What's the story of the submarkers bm408 I to IV? We have a lot of documents available - supplied by Charles Darrieu and Michel Molia - to tell the history. Maps: let's show the map of the terrain. 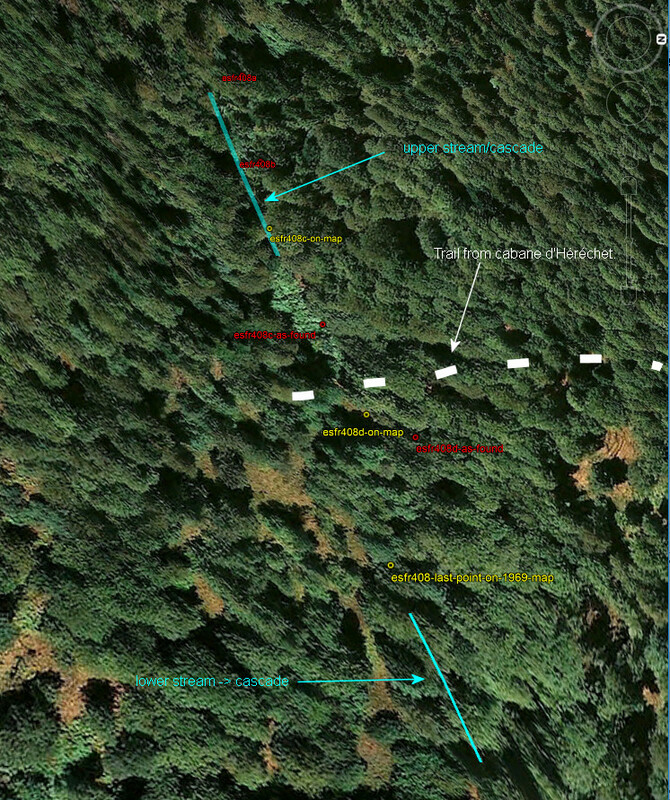 This is the basic IGN-map with the actual gps-waypoints of the bordermarkers added by me. You can see that the position of bm408 is indicated wrong at the map. The Procès-Verbal tells us that from bm407 the borderline leaves the ridge and heads straight to the origin of a stream, the "ruisseau du Terme". Bm408 was placed above this beginning ("birth") of the stream, 312m from bm407. 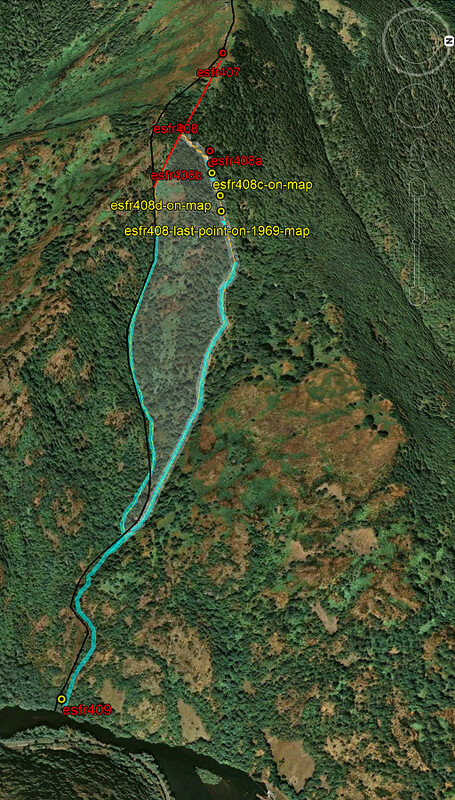 On this map however, bm408 is located on the ridge. The IGN-map with a hydrographic layer (Geoportail), showing far better the waterstreams. The southern one is the Ruisseau du Terme, the northern one (Ruisseau des Réchets) a stream which merges with the Ruisseau du Terme on the lower hillside. Then the IGN-map with the hydrographic layer and the cadastral map-layer (Geoportail). The calibration of the cadastral map with the IGN-map is not perfect. 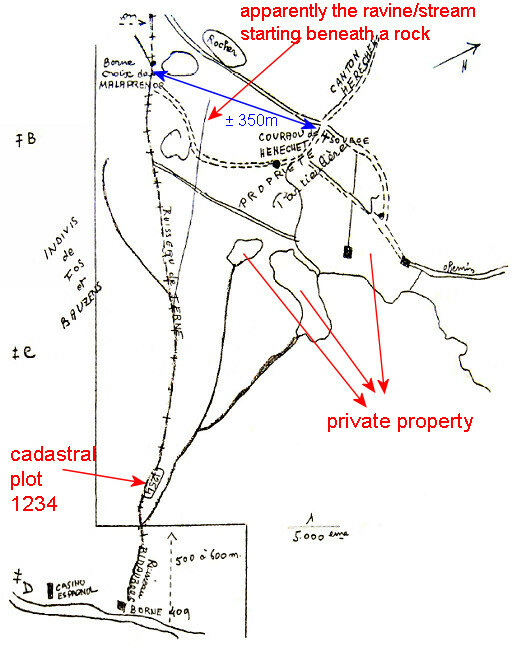 But what we can see is that there are patches of cadastral plots: private property. Finally this zoomin of the previous map. We can now read the toponyms and see that there is a "Borne croix de Malafrenor". En ce point, la ligne internationale abandonne la crête et descend par le versant septentrional pour aller directement à l'origine du ruisseau du Terme, appelée aussi Riou-Poudét. 408. Borne sur un rocher, au-dessus de la naissance du ruisseau du Terme, à 312 mètres de la précédente. La frontière descend par le cours de ce ruisseau jusqu'à son embouchure dans la Garonne. 409. Borne à cette embouchure, sur la rive droite du ruisseau et à la rive gauche de la Garonne. 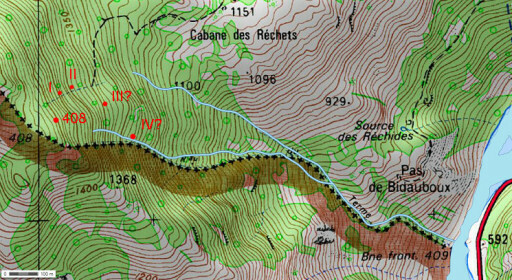 In my own words: from bm407 the borderline leaves the ridge and heads directly on the northern slope to the origin of a stream, the "ruisseau du Terme". 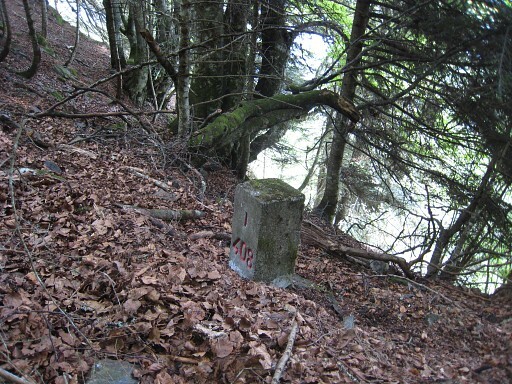 Bm408 is placed on a rock - 312m from bm407 -above this beginning of the stream. Then the border follows the course of the stream until its confluence with the Garonne where bm409 is placed. And we also have to tell about the peculiar "Terrain indivis de Bidaubus", an undivided terrain between the communities of Bausen (Spain) and Fos (France) but in delimitation-terms on Spanish territory. Let's start with a sketch of Jean Sermet with my explanations added. First: this sketch is wrong! It shows a triangular shape by assuming that cross D is near Pont du Roi. That's unlikely: the available evidence indicates that cross D was engraved approximately halfway between Pont du Roi and bm409. 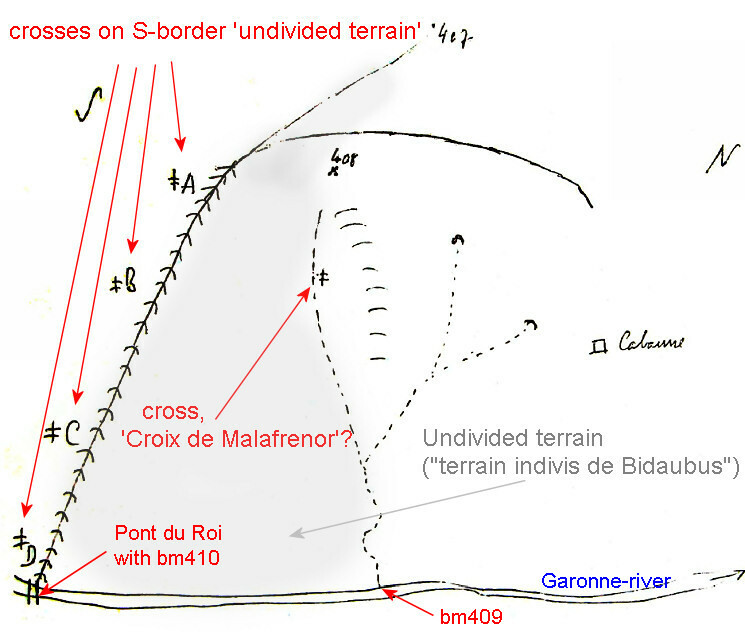 Moreover: the treaty of 1863 describes the line cross A - cross D as "more or less parallel to the Ruisseau du Terme". See hereunder. 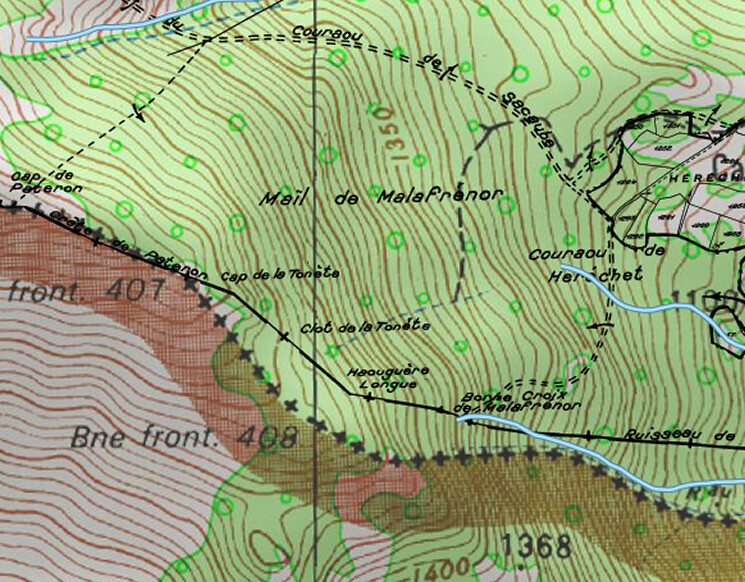 About the 'Croix de Malafrenor': that cross is indicated at the cadastral map at ± the same spot where Sermet on his sketch shows a cross. It was probably shown to Sermet in 1959, he describes a double branched cross. However, he thought it was a cross delimitating some unknown and forgotten communal border. Article 21. - La commune française de Fos et la commune espagnole de Rausen continueront à posséder par indivis le petit terrain de Bidaoubous circonscrit par une ligne qui descend avec le ruisseau du Terme, remonte par la Garonne jusqu'au Mail des Trois Croix et retourne à son origine par les mails de Muscadé, d'Evéra et d'Aegla. The "terrain indivis de Bidaoubous" - common ground, undivided between Fos and Bausen - kept his undivided status in the treaty of 1862. It's boundaries and 4 bordercrosses (with double branches and a capital letter) are described in detail in Article 5. We don't know where the exact spots of the crosses are: the toponyms can not be found on current maps. We have to rely on the text and there's some additional evidence on cross D.
- Cross D: after 665m at Mail des Trois Croix at a spot callend 'les Escaldes', above the path along the Garonne. By the way: a 'Mail' is a rocky outcrop on the mountain-slope (according to "La toponymie pyrénéenne" of M. Bérot). As said before, the exact spots of these crosses are unknown. 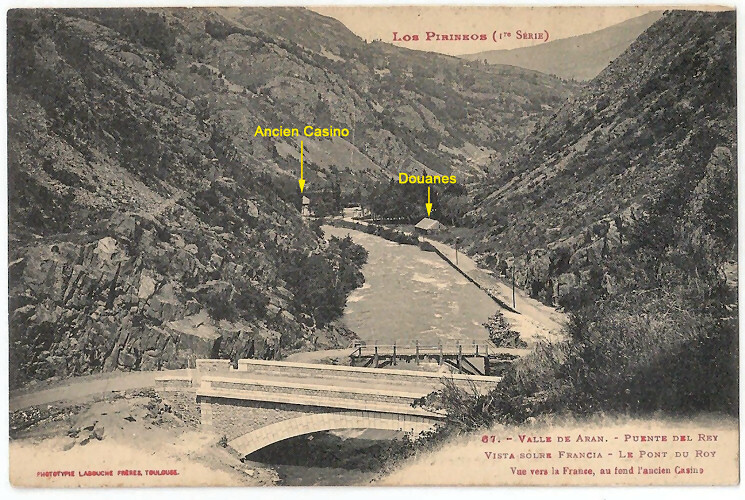 But we do have additional information on the spot of Cross D. The customs officier Albert Daumes (see hereunder) reported in 1960 about it's location: "not far from the French customs offices at Pont du Roi on a rock above the former Spanish casino." That casino has disappeared but we have several indications to its position. 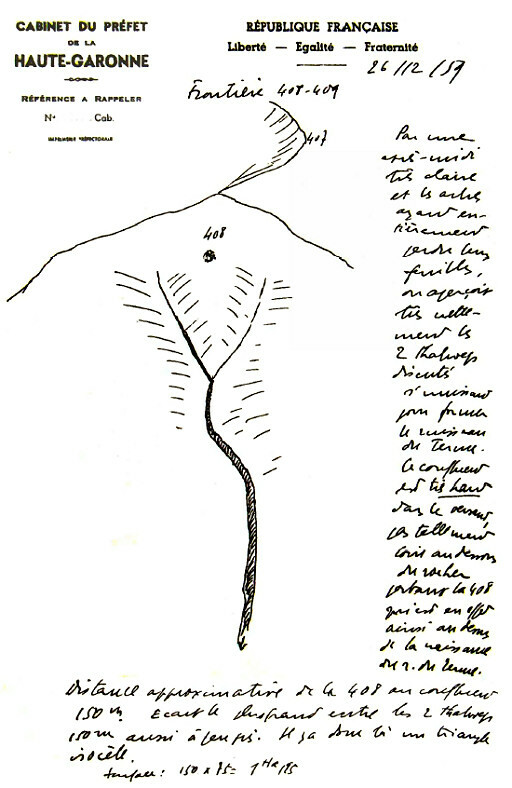 First: the map of Albert Daumes himself, see further on. It says: "Sight towards France, in the far end the old casino". That casino was on the left side of the river. And this is the old "casino espagno" at the left bank. On old maps we can see that there was a (dirt)road on the left bank, probably only accessible from Fos. Supposedly the casino was built here for French gamblers. In the far end we see a bridge over the Garonne. One can see that both dirtroad and casino went easily underwater after the flooding of the Garonne-banks after the construction of the barrage downstream. And on the internet we find this text. It tells us that on the road between Fos and Pont du Roi there was a triangular space with planted trees and a hangar with the Pont du Roi already in sight. We can recognize that triangular space on the cadastral maps. It might have been well the spot of the French customs office. On the other side of the Garonne - so tells us the text - there was a small building: the former Spanish casino. Then - combining the old pictures with the cadastral layer on the satellite map (geoportail-site) - we can reconstruct the probable spot of the old casino! Above the old casino there's a rocky outcrop: that could be very well the "rock above the former Spanish casino" which brigadier Daumes described. Final question: are these crosses still there? Sermet found back two of them (around 1960 or earlier, he doesn't tell which). The customs officier Albert Daumes could - in 1960 - only find cross D. It's location: "not far from the French customs offices at Pont du Roi on a rock above the former Spanish casino." Charles and Josette couldn't find any of them. I myself did a fruitless search on 20140907 on the supposed spot of cross D. You can check yourself the borderline and the spots of the bordercrosses on Google Earth with this kml-file. 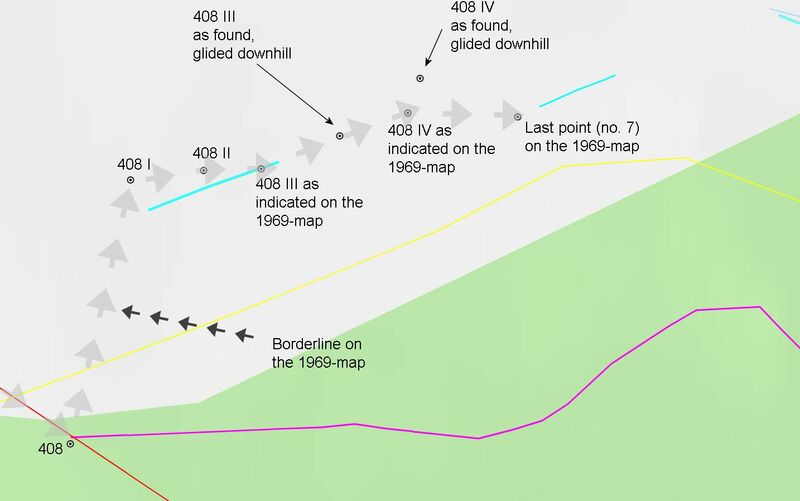 In short: until approximately 1959 the steep forested slope between bm408 and 409 was unused. But problems began when a Spanish forestry company started to deforest the Spanish side of the border and trespassed the border to continue in France. Jean Sermet - the French bordermarker-commissioner - and his Spanish counterpart Laureano Alija Llanos were asked to intervene. They visited the site and concluded that a more northern stream could be well the borderline, meant in 1863. That - dubious, I think - interpretation led eventually to the placement of the submarkers 408 I to IV.But let's tell the story in full detail chronologically. The French forest ranger Amédée Boussac discovers that the Spanish forestry-company has trespassed the esfr-borderline as he knew it. 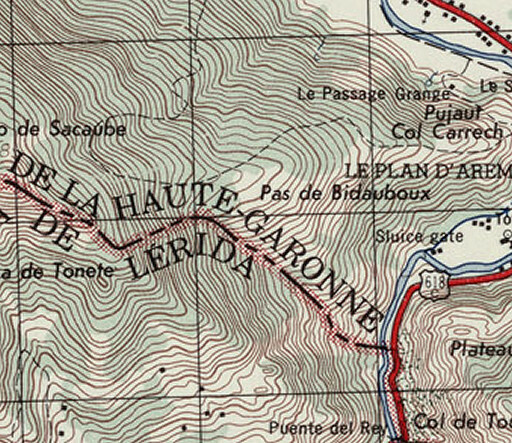 He knew well that the borderline at the hillside follows a stream, called the "Arroyo del Termine" or "Ruisseau du Terme" until the Garonne where bm409 is placed. The forestry company had bought the concession to deforest from the Mayor of Bausen, the Spanish village to the South. Apparently the company had already trespassed the border of the "terrain indivis de Bidaubus" without knowledge of the Fos community council. The forest ranger writes in a letter to Sermet that he- following Sermet's request - talked to the Spanish and that they disagree about the origin and the course of the Ruisseau de Terme or Arroyo del Termine in its upper part, below bm408. 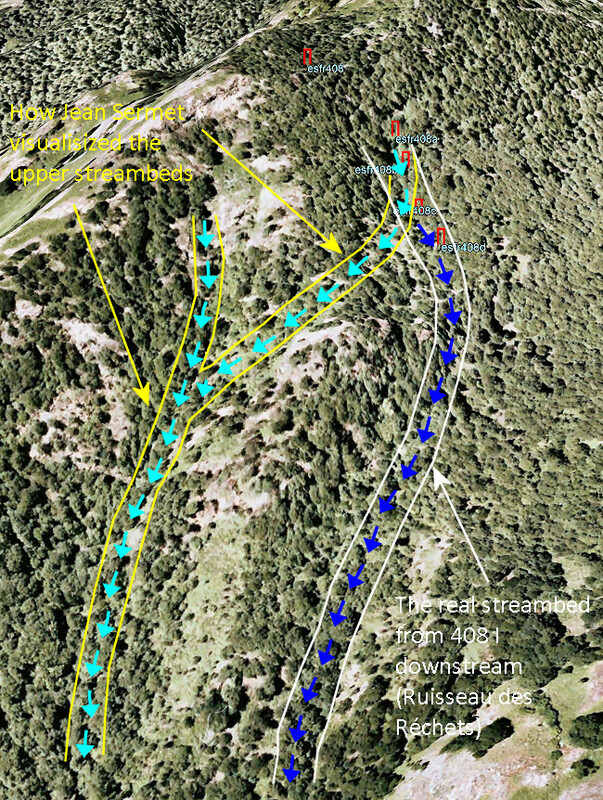 The Spanish stated that the word Arroyo indicates in Spanish a running stream and that the upper ravine beneath bm408 has normally no running water. On the other hand Boussac maintains that there is no other ravine originating beneath bm408 than that one. They ask Sermet to arbitrate. 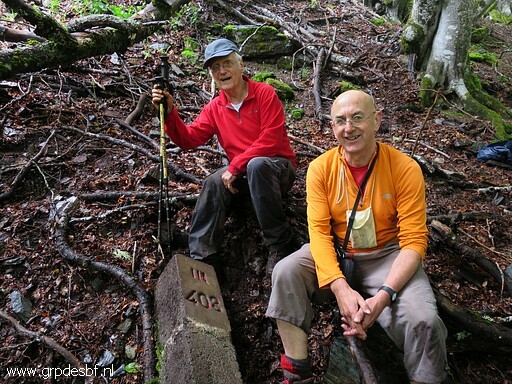 Sermet and Alija visit the site together with Boussac. We know that from a letter of Boussac. The forest ranger showed them an engraved cross which he considered as a delimitation of the esfr-border. I think that must have been the Croix the Malrenor. Though indicated at the cadastral map (apparently not consulted by them), they thought it had some relation with the Terrain Indivis. But it couldn't be one of the four crosses delimitating the S-border of the undivided terrain between the communities of Bausen and Fos. Those crosses have the letters A to D added. In later years, Sermet will write that he and Alija couldn't identify by sure (or disagreed) where the ravine of the Treaty was located. The southern ravine was surely the deepest but the northern one had running water. They lunched at the foot of that northern stream ± 150m NEE of bm408. That stream was to become the spot where later bm408 I and II were placed. Apparently there was an agreement: the foresters could continue until the middle of the "terrain en litige", awaiting a final decision. 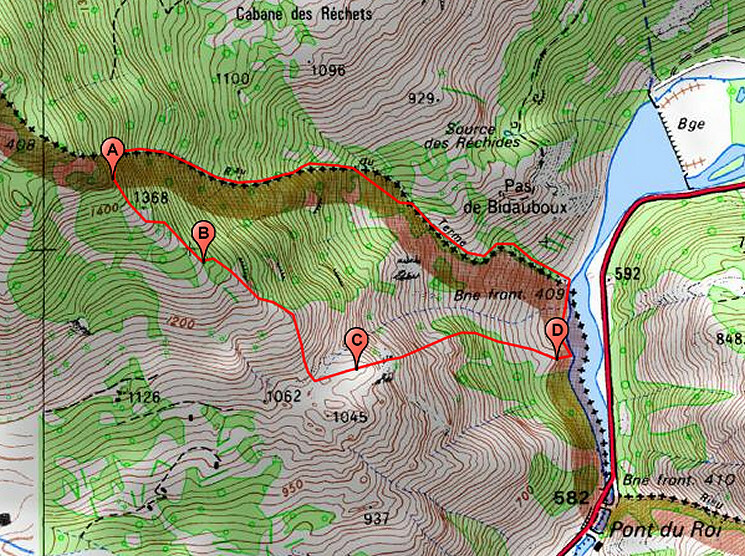 That terrain was estimated at 4 hectares (for example 100x400m or 200x200m). 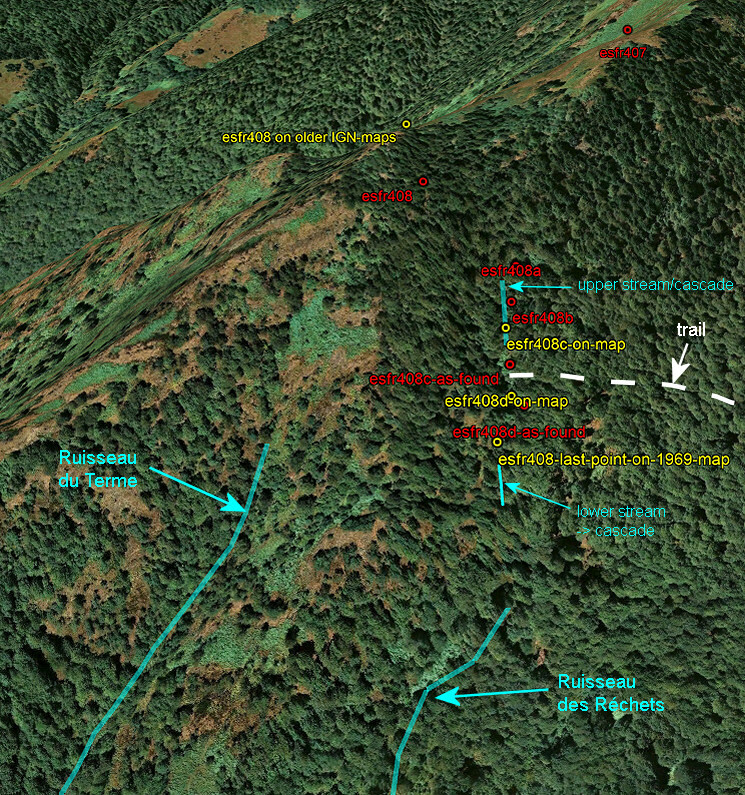 I guess that "terrain en litige" was the forest between the ravine (beneath bm408) and the steep stream to the NE. To get an impression how large that 4 hectares is, we can project its dimension on the map (without knowing where those 4 hectares were in reality). Well: not large. Boussac writes in letter to the mayor of Fos that the Spanish foresters have restarted there deforesting on the French side (north of the ravine), despite his interdiction to do so, awaiting the decision of the Committee. He demands that the foresters stop and that's what happens. Sermet and Alija are annoyed, writing to each other that Boussac neglected what was agreed upon in july 1959 (permission to deforest until the middle of the 'terrain en litige"). They feel sorry for the Spanish forestry entrepreneur, loosing so much money. They give the foresters the permission to continue their work. Alija even considers to call in Spanish policeforces to protect the foresters. Discussion between Alija and Sermet about the meaning of the engraved cross which Boussac showed them in july (see above). We read for the first time about a plan to place submarkers along the 'thalweg' between bm408 and 409, its course yet to be established by the 'Commission des Pyrénées'. Then we find in the documents this crucial sketch by Jean Sermet. He writes that on a very clear winter's day with the trees having lost all their leaves, he could see very well the two thalwegs which merge beneath bm408 to form the Ruisseau de Terme. It implies that the discussion on the course of the borderline was focussed on the UPPER part of the ravine. From the confluence onwards (downstream) there was apparently no doubt about the Ruisseau du Terme being THE border. BUT: there is NO such confluence very high on the hillside below bm408. BUT: we can well imagine how Jean Sermet got this erroneous impression. 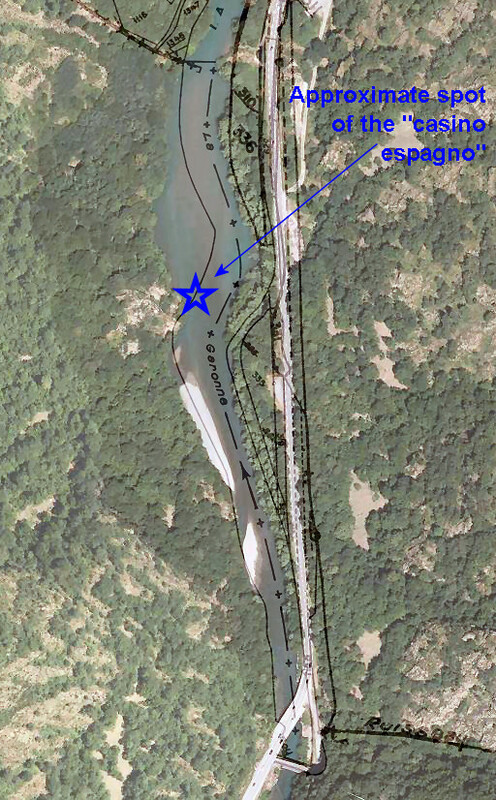 If we study the situation on Google Earth, there seems to be a ravin or streambed which connects the little nothern stream (where Sermet and Alija lunched in 1959) with the ravin of the Ruisseau du Terme. That's what Sermet observed from distance. But when on the hillside itself, one will see that there is a ridge in between. 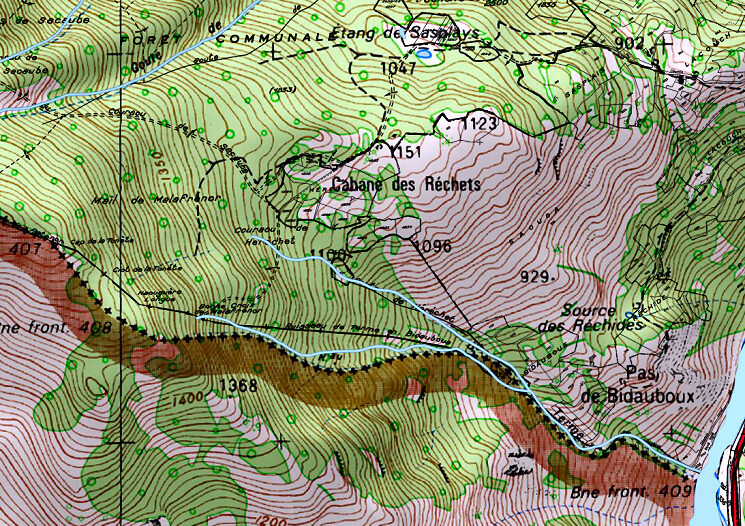 No way that the little northern stream could flow to the Ruisseau du Terme at this altitude. In fact the little stream descends (nowadays intermittantly, perhaps already in 1969) to the Ruisseau des Réchets and merges with the Ruisseau du Terme much further downstream. We have to remind that - as far as we know - Sermet visited the terrain only once, in july 1959. Later visits & reports were done by other men. Also the actual placement of the submarkers seems to have taken place in his absence. The officer Albert Daumes - stationed at the customs officie at Pont du Roi - describes in a letter his inspection trip to the borderline in question (bm407-409). He adds this sketch with apparently the cadastral map as a base. 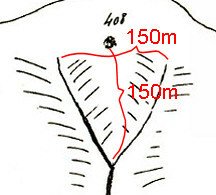 What is important that neither the map nor his description provides a confirmation of Jean Sermet's observation from long distance that there is a confluence of two streams ± 150m below bm408. 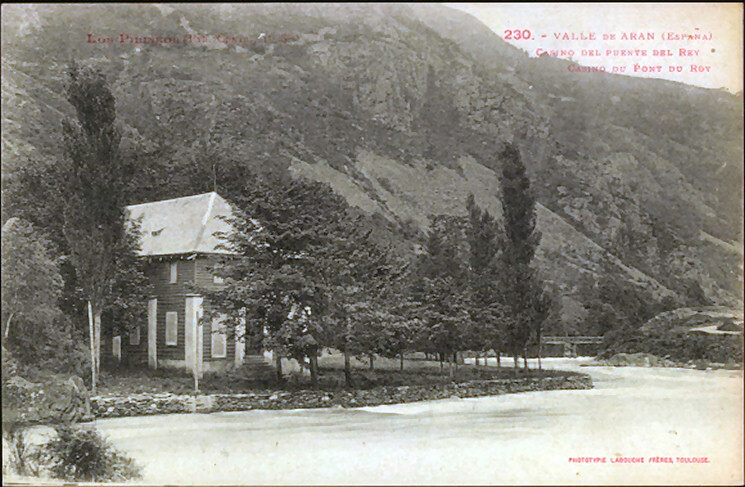 Daumes writes that bm408 is located 100m from the ravine of the Ruisseau de la Terme. 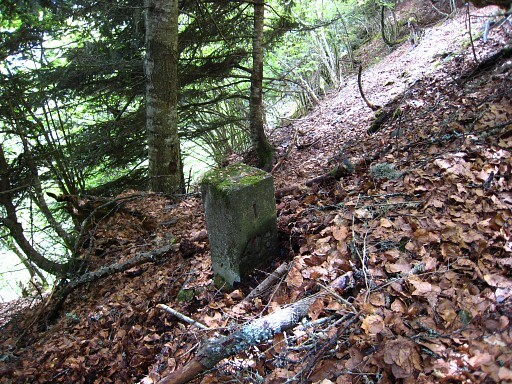 Then - 200m along that ravine - there's the engraved cross of Croix de Malaprenor ("beginning of the Ruisseau"). At the bottom of the ravine - at the Bank of the Garonne - is bm409. He continues: "there are other ravines if one could call them like that. One of them starts at the foot of a rock. There's another one but that one springs from private property of Fos inhabitants. Between these ravines, there's a cadastral plot which carries nr. 1254 (that's wrong, it must be nr. 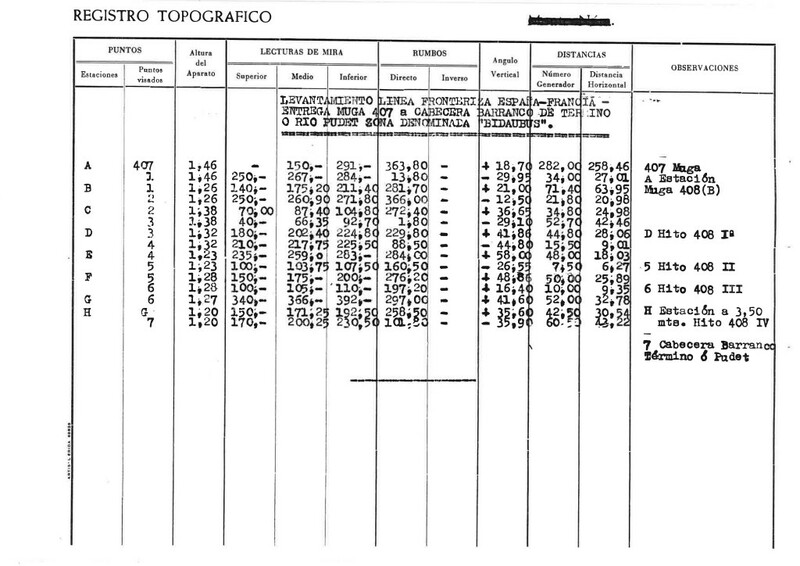 1234) on the cadastral map." At present - he writes - the deforesting is taking place 200 to 300m on French territory, passes private property and continues on the communal grounds of the canton d'Héréchet. The report of Albert Daumes proved that the Spanish foresters were neglecting the agreement of july 1959 and continued further on French territory, even on private property. In a long letter, Jean Sermet tells how he and Alija attended on 10 june a meeting with the Fos community council and - among others - the Spanish forester. Subject: indemnities by the Spanish forester Hirigoyen for cutting French wood. It was an urgent matter because - apparently - the cutting of the forest was halted and the transport of the wood to Spain forbidden. 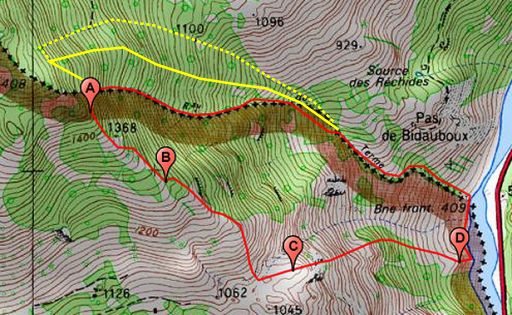 We read that the cable (to evacuate the logs from the hillside) was installed or ended on French territory. Anyway, it is clear now that Hirigoyen had gone too far. He had already settled indemnities with two private owners. His offer to the Fos community council (300.000 francs) was however received with indignation, they expected much more. In the end they agreed on 500.000 francs. One problem remained: what was exactly the border of the 'terrain litigeux', the terrain still in discussion whether it was French or Spanish. That had to be resolved in the future by the Commission Internationale de Pyrénées but now it needed a delimitation to mark the outer line for the Spanish forestry-company. The customs officer and Boussac (the forest ranger) were reluctant to get involved and to commit their organisations by marking a borderline on - they thought - French territory. Finally Sermet ordered that Boussac, a representant of Hirigoyen and one of the Fos-community would climb the mountain the next day. Together they had to mark the northern border of the 'terrain litigeux'. Not by climbing up and following the most northern stream as the foresters had done but by starting at bm408 as the description of the treaty does. NB: this is an interesting phrase: it suggests that the foresting started near the Garonne near bm409 at the Spanish side and that the lumberjacks worked their way uphill keeping the Ruisseau du Terme at their right hand as their territorial limit. But not far uphill there is a bifork of the stream (looking upstream): left is the Ruisseau du Terme and right the Ruisseau des Réchets. One can imagine that is was tempting for the lumberjacks to take the right stream as a limit or they just assumed it was the Ruisseau du Terme. In that way they trespassed the real Ruisseau du Terme. The higher you get, the more those two streams deviate from each other and the more French terrain was trespassed and French private parcels deforested. 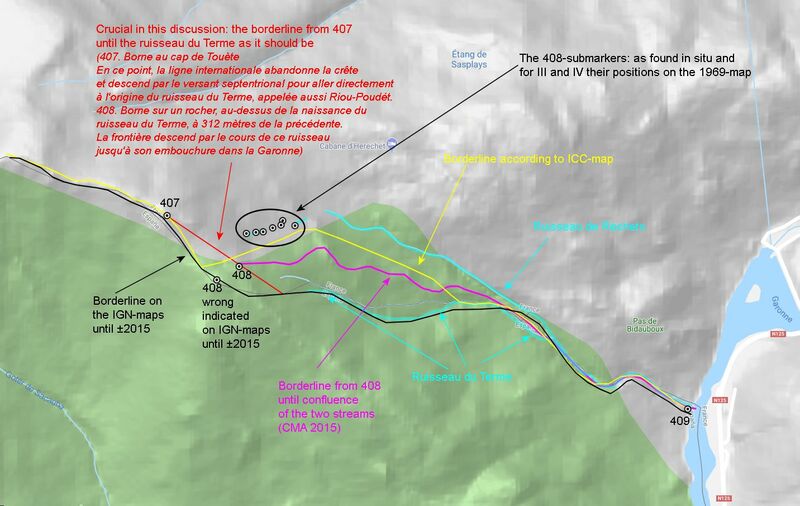 Then Sermet writes a crucial direction: "Because the treaty says that bm408 is placed above the beginning of the stream, you have to take the most northern stream. There is - in this terrain - a stream springing from a source where last summer the Commission Mixte has lunched. It's less than 100m from bm408. 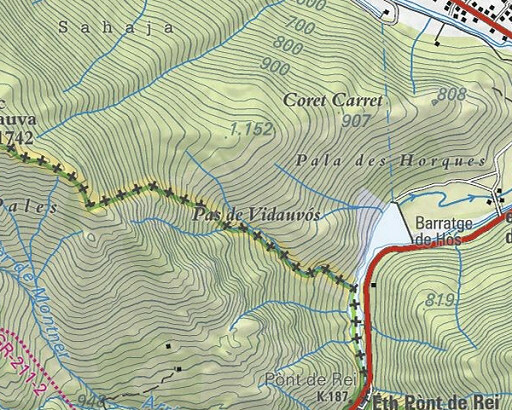 From this source and descending along the steepest line ("la ligne de plus grande pente") to the principal Thalweg, that will be the northern border where the foresting has to stop." NB: It's a puzzling phrase: "la ligne de plus grande pente". What had Sermet in mind? Still the conviction of a confluence of two streams very high on the hillside thus a minor ceding of French territory to Spain or did he already realize that a large stretch of terrain (± 16 hectares in stead of ±4 hectares) would be lost? The steepest line will be how water will gather and constitute a stream. In this defintion it's the small northern stream descending to the beginning of the Ruisseau du Terme as shown on the map above. Did Jean Sermet know that? Finally in this letter he praises the mayor of Fos for his cooperation and again accuses Boussac of being stubborn for maintaining his vision that the most southern ravine (Ruisseau du Terme) is THE borderline. In the exchange of all the letters, it seems that Sermet sympathized more with the Spanish forester - having invested in a cable installation and hiring workmen - than with the French forest ranger who bravely defended French territory. But - in this letter - he admits that Boussac's conviction is also his "personal feeling" but while awaiting the decision of the Commission Internationale de Pyrénées he could not express that conviction in this conflict. We have no evidence of how the foresting ended but one may assume that after two years the hillside of Bidaubus was deforested, further trespassing on French territory anyway stopped and the private landowners and Fos-community having received their indemnities. The forestry company left and the peacefullness reinstalled on Bidaubus-hillside. But ....... the machinery of changing the borderline could not stop. Jean Sermet describes in his "De quelques questions touchant l'abornement frontalier Franco-Espagnol (1949-1998)" that he and Laureano Alija Llanos placed in the course of the 1960-ies four submarkers. That wasn't easy - he recounts - because of the steepness of the terrain. We read elsewhere that in 1963 the scheduled placement of the submarkers was postponed because of bad weather conditions to the next year if a long period of good weather would present itself. But there's a letter of the Préfet de la Haute-Garonne stamped 21/7/1970 to the ministry of Home Affairs stating that the "matérialisation" took place in 1969. Moreover and very interesting: this letter tells us that a topographic map was drawn with the location of the submarkers. That map was presented in 1970 to the "première Sous-Commission de la Commission des Pyrénées" and approved. The borderline between bm408 and 409 had changed and four submarkers were installed, long after the dispute with the Spanish forestry-boss Hirigoyen. But nothing changed at the Bidaubus-hillside, so it seems. French shepherds kept using the terrain as before. Nowadays the Fos-people know nothing about this conflict or about a shift of the border or about submarkers. 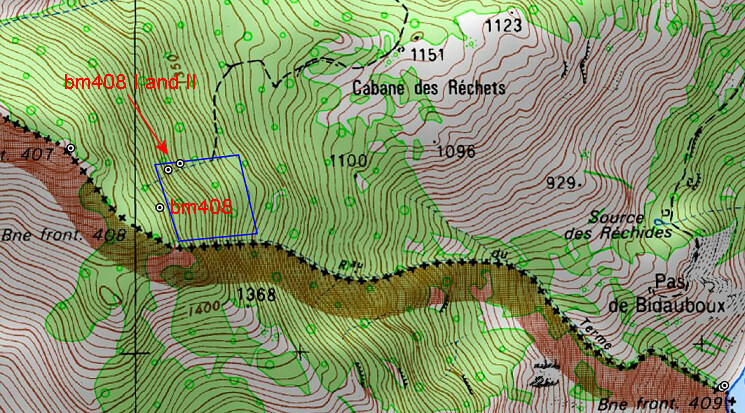 Also there was no change whatsoever of the borderline at the French topographical map: this is a map of ± 2015 (from the site of Géoportail), still showing the borderline as ever, including a wrong position of bm408. And that borderline is even roughly the same as on the l'État-Major-map from between 1820 and 1866. Very important: one can distinguish the Ruisseau de Réchets merging with the Ruisseau du Terme. It proves that wether the Treaty of 1863 was already implemented or not on this map, the Ruisseau du Terme was considered as THE borderline. The Spanish maps however seem to show roughly - I repeat: roughly - the new borderline. This is an actual screenprint (august 2018) from the Catalonian topographic website. Conclusion: all this fuzz about a new borderline and submarkers led to zero change at the official French and Spanish maps. And let it be clear: this change was approved by the official franco-espagnol Commission Mixte d'Abornement in 1970. I put the geographical data of the borderlines & bordermarkers in this file: esfr-bm407-409-mapdata-vs02 (click to open in Google Earth). They are projected on the IGN-map above. Light-blue streams: their courses derived from the ICC-map and the google-terrain map. Conclusion: the official maps give no clue to as where the new borderline was supposed to be. 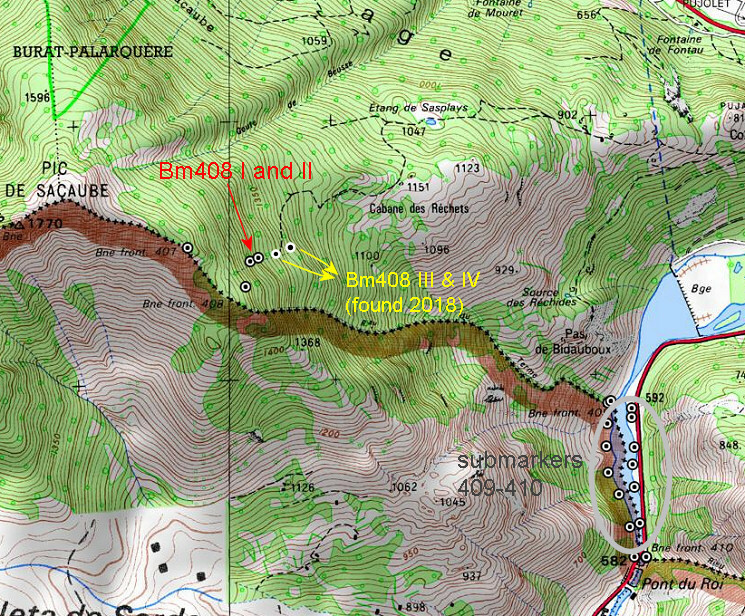 We know the locations of bm408 I and II, they are still present at the top and along the small northern stream cq cascade where in 1959 Sermet and Alija lunched. But nr. III and IV remained unfindable as was the cadastral map with their positions. Michel Molia did many searches up there and Charles Darrieu and me also couldn't find them. Why is that important? Their position would reveal how the new borderline was meant to be. We (Michel Molia, Charles Darrieu and me) had a lot of discussion about this. In general we talked about two options. 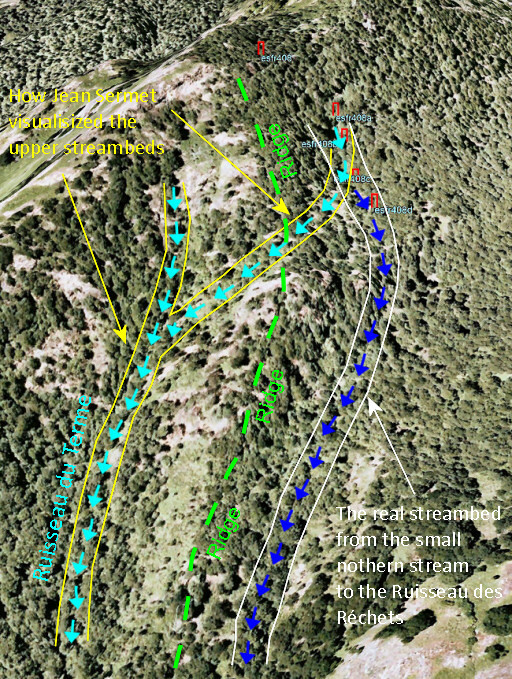 This hypothesis makes also sense because the documents show that the discussion focussed on the upper part of the hillside: the terrain underneath bm408. Sermet thought that there was a connection between the northern stream and the Ruisseau du Terme at a high level. 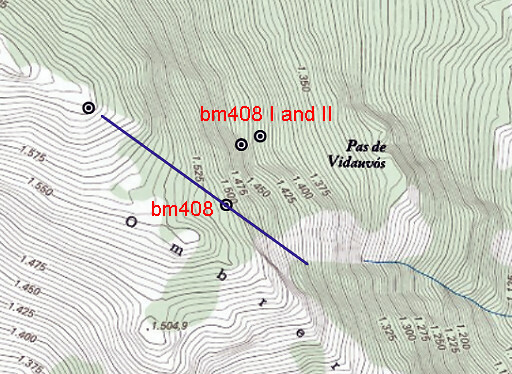 Michel Molia (see his website) has been intrigued by the fate of the lost bm408 III & IV and visited the hillside of Bidaubus many times, often sleeping in the cabane d'Héréchet. And he went on a search in the archives on a quest for the lost cadastral map of these submarkers. And he did find it! (click picture to enlarge) And this is the map drawn in 1969 after the placement of the bm408-submarkers. It reveals that bm408 III and IV were placed not far away from I and II and roughly in the same line. In fact a part of the terrain which we crossed so often. (click picture to enlarge) The map was accompanied by this table of surveyor-data. As you can see: no coordinates themselves but intermediate distances and angles. Geometricien Philippe Barsacq (a friend of Michel) converted these 'old-skool'-data in modern gps-coordinates with the well established coordinates of bm407 and 408 as reference. 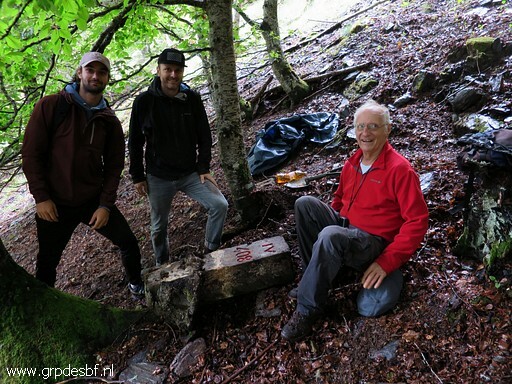 On 31 may 2018 Michel Molia went for his final search, together with his son & grandson and me and Jan-Willem Doomen. And bm408 III and IV were found back! Both had slid downhill from their original locations and were half buried in the ground. See the full story on this webpage. 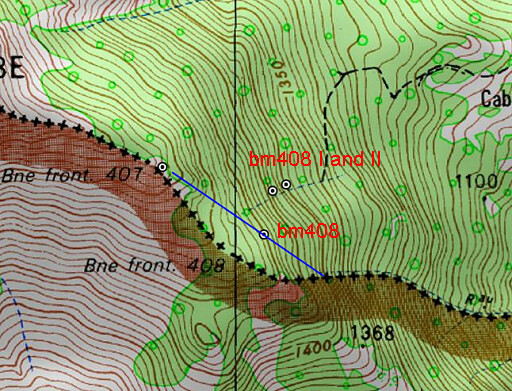 (click picture to enlarge) First the new borderline as drawn on the cadastral map and the waypoints of bm408 to 408d. This is the overall view. Conclusion: bm40 I-IV were placed along an intermettant stream, descending to the beginning of the Ruisseau des Réchets. The Ruisseau des Réchets merges much further downstream with the Ruisseau du Terme. In this materialisation of the submarkers in 1969 (and approved by the CMA in Madrid of 1970), a large and long-stretched terrain was ceded to Spain. Let's show that ceded terrain on the map. The surface lost to France is considerable: ± 16 hectare. It affects two private cadastral parcels who became Spanish. As said before, it seems that something has gone wrong here. 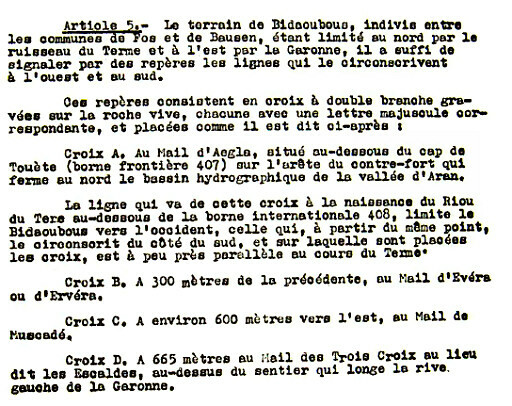 If we read the letters exchanged while the conflict heated up, we see that bordercommissioner Jean Sermet talks about a small disputed terrain in the upper part of the streams of about 4 hectares. And my hypothesis is that it all comes down on the erroneous observation of Jean Sermet in 1959 as mentioned above in which he expected that a minor change of the borderline would settle the conflict. DID SERMET AND ALIJA MAKE A MISSTAKE WITH THEIR NEW BORDERLINE? In my own words: from bm407 the borderline leaves the ridge and heads directly on the northern slope to the origin of a stream, the "ruisseau du Terme". Bm408 is placed - 312m from bm407 -on a rock above this beginning of the stream. Then the border follows the course of the stream until its confluence with the Garonne where bm409 is. There's no doubt that bm407 and 408 - though rebuilt in the fifites - are placed on their original spots as they were meant by the delimitation commission in the 19th century. Jean Sermet himself writes that the masonry bases of of the ruined bm407 and 408 were still there when they erected the new bm's. And: the treaty-text inevitably implies that bm408 must be on that direct line from bm407 to the origin of the stream. Let's draw that direct line on several maps. The French IGN-map. Note: bm408 is indicated wrong at this map as said before. 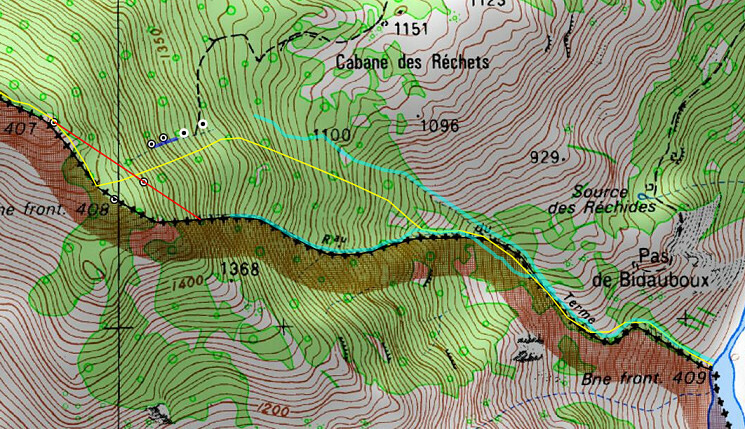 Conclusion 1: the blue line heads straight via bm408 to the beginning of the Ruisseau du Terme and NOT to the stream of bm408 I & II. Conclusion 2: if that northern stream (of bm408 I & II) was meant to be the borderline according to the delimitation commission of 1863, they would have placed bm408 at another spot. The Catalan ICC-map with its detailed elevation-lines. In this zoom-level, there's no borderline indicated by the Spanish. But the map confirms the conclusions above. Overall conclusion: there's no ratio whatsoever for bm408 I and II, the Treaty being very explicit about the course of the borderline from bm407 onwards. Why did Sermet & Alija make this mistake? One can only guess. Was the main goal of the arbitrage the diplomatic settling of the argument? Did the positive feelings towards the Spanish forester bias their judgment? Are their personal reasons: was Sermet - being close friends with Alija (as their mutual letters reveal) - too keen on compromising? We will never know. Can this misstake be reversed? This question brings us into the realm of international law. A retired lawyer - David de Oregon (nickname?) commented on this subject on my blog. His conclusion: "what would have been ‘mis’-placement originally, turns into the very definition of ‘correct’ placement." So: the answer is apparently no. So France lost 16 hectares of territory due to an avoidable misstake or to a too keen intention to compromise. Does anyone care? I don't think so. And a question rises: who is aware of this territory-shift? The French and Spanish maps are still the same and the locals of Fos are unaware of any change or just don't care. The digital age offers new possibilities to delimitate the border more precisely. That's where the European INSPIRE-project stepped in from 2007 onwards. The borderline and bordermarkers between France and Spain are precisely measured with gps-devices and the results discussed in the binational committee of the Commission Mixte d'Abornement (CMA). However, in this case (CMA-meeting 2015) its proceedings are not public and we have no idea which arguments were exchanged in case of disagreement. But we can watch the results of the fieldwork and the level of CMA-agreement on this webpage with an nice explanation on this webpage. The CMA is a binational committee with a long history, discussing and deciding on border-matters and bordermarker-issues on the French-Spanish borderline. There are 4 Spanish members and 3 French members. Its agreements can involve changes of the borderline, apparently without a final binational treaty needed to implement the change. In 2015 the results of the INSPIRE-fieldwork was discussed in Toulouse and the digitally established borderline was approved. As said, you can check that on the map on this webpage: if the borderline is blue, it is approved. Unnoticed remain at least two cases in which the borderline was changed, one of them is the border on the Bidaubus hillside. Unfortunately, the proceedings of this meeting being not public (though the proceedings of 2014 and 2012 are available on this page), one wants to know the reasoning. The INSPIRE-project to delimitate the border precisely prompted the CMA of 2015 to decide what to do with the borderline between 407 and 409. As said: the Treaty is - in my opinion - unassailable about its right course but how to deal with the dubious new borderline established in the 1960-ies? And - besides - what was its exact course without knowing the position of the lost markers 408 III and IV? I guess they assumed the new borderline to be as in the above map. One thing is sure: the French delegation had the best cards with the explicit Treaty-text, the undisputed locations of bm407 and 408 and the evidence of the État-Major-map. They had thus THE chance to restore the border to its original and rightful course. But they agreed to the most simple solution, cutting the disputed terrain in half. Still a loss of ± 8 hectares of French territory compared to the pre-1969 situation. The next map summarizes all the data and reasoning. The purple line is the borderline from 2015 onwards. From bm408 it follows a minor ridge between the two streams until their confluence on the lower part of the hillside. (click picture to enlarge) The purple line is however incompatible with the Treaty-text and ignories the historical evidence of the bordermarker-locations of bm407 & 408 and the borderline on the l'État-Major map of the 19th century. The French state-run CNIG has as its mission to inform the government in the field of geographic information. Pierre Vergez is a high-rank civil servant within the CNIG and in charge of the project to digitally establish the French borders with its neighbors. He - in a militant email-conversation - labeled the new borderline as an "intelligent" diplomatic masterpiece about some "useless square meters". He mentions opposing views of the Spanish delegation they had to deal with but what is there to oppose when the odds are completely at your hand? Perhaps he was embarrassed by the presented evidence by us concerning the 1863-treaty and the Bidaubus-conflict. Still: this evidence is abundantly available on the internet and assembled and discussed on our websites. One must doubt if he - and the French CMA-delegation - did their homework well. What stroke most: in so strongly defending the CMA-decision, he acted as if he was the chairman of the CMA. But he is not. At his best, he should have been an impartial consultant to the CMA. But it is my assumption that it was he himself who came up with the "intelligent" idea of following the ridge between the two streams. A convenient technocratic solution fitting a technocratic civil servant from far-away Paris but - as said before - incompatible with the borderline that the authoritative Treaty-text of 1863 prescribes and the historical evidence. I can imagine how the Spanish eagerly complied with this compromise. But we shouldn't blame him (if the assumption is true). The French members of the CMA are responsible for agreeing with this compromise and in my opinion, they didn't perform their job well on this matter. As told above there is a large terrain of common ground south of the Ruisseau du Terme, common for the communities of Fos (French) and Bausen (Spain). 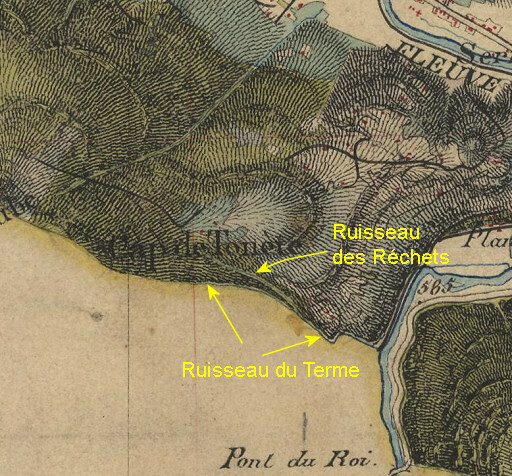 If the northern stream of the Ruisseau des Réchets is upgraded to a presumed borderline, considering it as the Ruisseau du Terme meant in the 1863-treaty, the common terrain is inevitably expanded to the North. That would imply to the Ruisseau des Réchets (yellow dotted line). In any case expanded to the new borderline (yellow line) between the two streams. What does that mean in practical sense? For example hunters from Bausen will have the full right to enlarge their scope to the North. Same story for collecting mushrooms or cutting wood. France has lost 8 hectares of its territory for no reason. Is it too late? I don't know how omnipotent the CMA is in its decisions or in what way local authorities and communities can initiate a reconsideration of this decision.